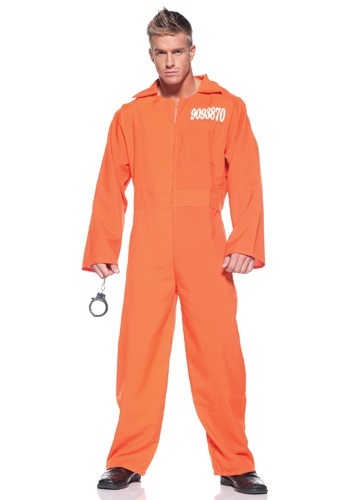 We’re not entirely sure why you’d want a Men’s Prison Jumpsuit like this, but we’re glad that you’re shopping for it on the internet instead of defacing public property or putting on a lewd display in front of the local police department. Because frankly, you look like a pretty intimidating person, and we don’t think we’d feel safe sharing a cell with you. Hang on a second—what are we in here for? Okay, when you put it like that, it sounds like we’ve done some pretty crazy stuff. But that was fake blood. Nobody really got hurt! Plus, it was all spilled in the name of great Halloween costumes. Hey, don’t we get a phone call or something? And where are the film crews? Isn’t there supposed to be an investigative documentary or courtroom drama that’s going to tell our story? Well then. We’d better go get ready for a long talk with our legal team. On the bright side, at least we can tell you how much you should enjoy every sandwich, and every moment you get to spend out there in the sunshine and fresh air. Which is a lot! Don’t make the same mistakes we did. Put on a Men's Prison Jumpsuit if you must, but be sure to stay on the right side of the law! In the meantime, go dig up that thing we buried that one time. With any luck, we’ll catch up to you on a warm and breezy beach south of the border!